It’s the end of Summer – traditionally, as Doctor Who’s back – so how was your holiday? Did you go anywhere nice? We went to North Yorkshire for a week, which is relatively usual, then I spent all of mine in hospital, which isn’t. When I’ve not blogged for a while it’s often due to some of my many long-term health problems, so I’ll try to make light of it by saying afterwards that “my health has been worse than usual – as usual”. That week and all the last seven weeks have made this weak gag rather less funny. The first thing I should say is that while this was intensely awful at its worst, like all my other miserable long-term conditions (and the bonus ones that frequently pop up to join them), its effect was low quality of life rather than life-threatening. So that’s one awkward question you don’t have to ask. The worst effect of it was that my lovely Richard, who has more than enough to cope with anyway, had to work seven hours a day visiting me and more in his ‘time off’ answering all the questions from family and friends that I wasn’t able to cope with. So he deserves a medal and really, really needs an actual holiday. If you happen to be in touch with Richard, please be especially nice to him, as he’s been having a particularly knackering time and, unlike me, can’t spend days in bed after swallowing fourteen pills (my apogee combination of antibiotics, painkillers, especially good hospital painkillers and ordinary prescriptions – I’m down to a smaller number now). It hasn’t been terribly pleasant for me, either. The week in hospital – for all my terrible health, the first actual hospitalisation of my adult life, though I spent months there as a kid – was of course the worst, involving amongst other things very, very much more pain than I’m used to coping with, almost complete physical incapacitation, humiliation and discovering that I do have some physical vanity after all on getting an unexpected and upsetting blow to it – which like several other things is still not mended. But in some ways the most difficult thing to deal with wasn’t the most intense part but the very slow recovery. One of my ways of coping with the way ill health usually knocks me out at random is, after the Ray Milland alcoholism film The Lost Weekend, to tell myself my incapacitated time was a Lost Morning, or a Lost Day, or a Lost Week, so that by naming it I can mentally file it away and not dwell on it. 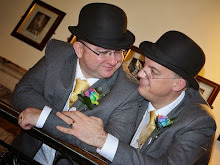 I can’t just dismiss a ‘Lost Month And A Half’, especially when both Richard and I are getting rather stressed now that our preparation time for our wedding, which had been going all right, has been cut in half. I suspect this may make me still more wary in future of booking anything; other than my income being technically zero (sorry, Richard, again), I am forced to miss so many things that I’ve paid out for even with my ordinary health problems that I sometimes get to the point where I rarely leave the flat – or get too stressed that I might not be able to when needed (yes, I am listening to the complete works of Kate Bush and feeling jealous as I type). So if you’ve ever wondered why I don’t seem to be about at a Lib Dem Conference, say, then tell me I’m looking well when you eventually see me, there’s a strong chance that I may have been mostly knocked out in a hotel room for the previous forty-eight hours and, on getting out for an evening or an afternoon, be what’s technically termed ‘faking it’. That’s when I don’t just turn entirely inward as a way of coping, a strategy that did at least get me through a week in hospital without going berserk. I said there’d be entertaining bits, so I’ll tell you that I’ve learned two ‘Be careful what you wish for’ lessons that many a man would grip a monkey’s paw for: one of them isn’t printable in this less TMI version, but the other is ‘I wish it would seem like time on holiday went more slowly’. Well, it certainly did that. OK, preliminary rambling over, here’s the abridged version of what’s been going on. Back on Sunday July 13th, I started feeling ill, painful and swollen, recognised the symptoms as a nasty infection I’d had once before (though as it turned out to a tiny fraction of the severity), and rather than putting it off as usual because I tend to hope anything new will just go away, decided to deal with it if it hadn’t passed by after I’d slept on it. So on the Monday, with it all much worse, I got a taxi – with a non-stop-gabbling taxi driver so loudly and horribly a Kipper that I wondered if he was a method-actor testing out a stereotype – to seek medical advice, seeing a very nervous doctor who gave me what turned out to be seriously feeble antibiotics. Still, I spent the week mainly trying to rest in order that we’d be able to go on our holiday. I didn’t go out; I missed a pre-booked book evening in town with Neil the Husband In Space and Jenny Colgan; the swelling got worse, but with the (duff) antibiotics, constant paracetamol and not moving the heavy flu-like symptoms seemed to be retreating slightly. What could possibly go wrong? Having fooled myself things were improving, Richard drove us up to Stockport in a nightmare journey of traffic jams in order to see my parents, for whom I looked much better (see ‘faking it’). The next twenty-four hours were when everything that could went rather wrong at once. As well as getting increasingly feverish as a side-effect during the journey up, the main infection was getting more and more painful while swollen and constricted in a car seat, and I wasn’t able to get any sleep. So that night I was pretty much exhausted – which was unfortunate, as we’d chosen a hotel at random and turned out to have booked into the worst hotel in Stockport. It seemed almost funny at the time. 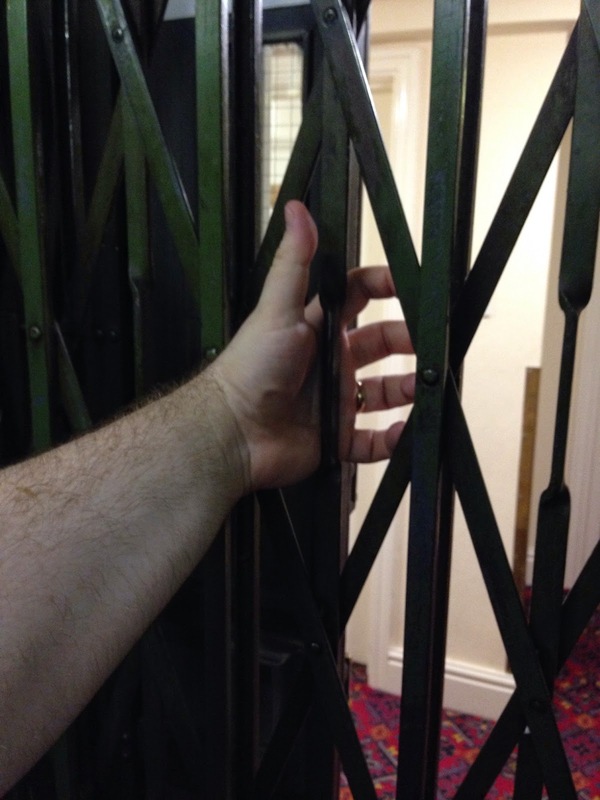 It looked astoundingly like the hotel from Doctor Who – The God Complex, complete with the same cream doors and red paisley carpet, except that even they’d not been able to find a hotel so stuck in the 1950s that it still had a lift with hand-pulled outer shutters and inner cage. It must be thirty years since I was last in one of those (probably not since they pulled the old Hazel Grove Co-op down). It was absolutely sweltering that night, and the place had no air-conditioning, so I did what any rather odd person running a fever and feeling rather out of it would do: reeled around the place after midnight Tweeting that I was trapped in a Sapphire and Steel story. You can read this improbable timeline here: one, two, three, four, five, six, seven, eight, nine and ten (three, five and eight are my favourites). Not the most entertaining of the photos, but the one that shows lift, carpet and cream. It got a lot less funny when we tried to sleep. However loud the storm outside, even with the window propped open the crack it would allow, the temperature in the tiny room was soaring and so was mine, so despite my pain and tiredness I was only able to get a few short stretches of sleep. Now, I ordinarily tend to sleep badly, but most days keel over for a couple of hours in the afternoon to deal with it; when I’m short of sleep even in relatively normal health I tend towards testy, headachey, incoherent, unsteady and vomiting (and all without touching a drop). This will all be a bonus later in the day. And so we crawled out of bed on the morning of Saturday July 19th, me in a much worse state but Richard also deprived of sleep both by the heat and a feverish fiancé, and more worryingly the one who had to do all the driving. We planned to take some stops along the way from Stockport to Sutton-Under-Whitestonecliffe; as it turned out, the traffic again did that for us, with more massive tailbacks, another long trip taking twice as long as it should, and my trying not to say anything about the effect it was having on me when there was nothing either of us could do about it. One thing I should have done was taken off my shoes and towelled my feet; we’d been out in heavy rain for a couple of minutes in the morning, and I was very soggy. But even bending was by this point excruciating, so I suspect I also caught a chill which may not have helped later. At long last we arrived at our destination. I got out of the car and went into the office to say hello and get the keys to our self-catering cottage. I was aware at the back of my mind that I was feeling very unwell indeed, but kept standing, bantered – faked it – and it was fine. I was fine. I’d just get my clothes off, dry off and have a sit-down without being jammed into a car seat, have some water and a couple of paracetamol and I’d be fine. We’d got there. We could relax. I literally collapsed within two minutes of opening the cottage door. Now, I’m frequently tired and ill and in pain and have to lie down for a couple of hours. Most afternoons, probably. And I label this ‘collapsing’. I think I need to find a new word. Because having held off the worst while doing the bits I absolutely needed to, like travelling, seeing my side of the family and being in public, something suddenly snapped. I fell onto the bed and couldn’t get up. For two hours I couldn’t move except to weakly reel about when being in one position was too much. I was in suddenly unbearable pain of several types (one of the worst of my usuals, stomach like a bag of knives, coming in just when I didn’t need it). For the first half-hour I couldn’t get my teeth to stop chattering enough to speak. I was shaking, sweating and running a high fever. I threw up the painkillers within minutes of taking them, babbled incoherent guilt to Richard when I could get words out through my shudders, and kept telling myself that I was just too exhausted and if I could only get to sleep, I would get better. After two hours of this, I gave in and rang 111, because I didn’t want to trouble them with something that wasn’t very serious. I could still barely speak and hardly move at all, and they sent an ambulance immediately. It turns out they thought I was very ill indeed, and it turned out they were right. I’ve only once before been taken off in an ambulance as an adult, when quite a few years earlier I was having several hours of chest pains (which fortunately were just a combination of asthma and muscle spasms). I was given gas and air that time, which relieved the pain and was very jolly (for me, at least. They didn’t give Richard any to relax him, so he was dreadfully worried). So I was a bit disappointed when the gas and air this time made the pain only slightly less intolerable, and that only in the moments I was actually breathing it in. They offered me morphine, which I’ll admit I was wary of but was fantastic (kids: don’t listen). Or at least let me slowly start to cope. I was rushed to the hospital in Northallerton, with Richard – who fortunately knows the area – following in the car (not a great time for him after two days of horrible drives). He stayed with me through all the initial hours of pokes and proddings until I was consigned to a ward about 1am. I didn’t take any photos that evening, or for the next few days, which is just as well. I was given rather a lot of drugs through two different drip-feeds and as a consequence got more sleep that night. In fact I can’t tell you a great deal about the Sunday, as I was constantly dipping in and out of consciousness, and couldn’t actually move without a lot of help – still less make much sense – until the Monday. I do remember using the counter on the electronic box that combined my twin feeds to calculate the time and then counting slowly for the half an hour until three o’clock when I was sure Richard would come. He was stuck in the car park and got in about two minutes past; he was the first to arrive at visiting hours (and the last to leave, but I won’t talk about an excessively rude nurse noting that as the others were very much nicer), but I was not at that point coping well and nearly cried when he didn’t appear on the dot, as I wasn’t up to devising any other coping strategy, then nearly cried again when he appeared to look after me. It’s startling how much hope you can build up on one tiny thing when you’re in an awful state. That’s a line from Andy Lane’s very entertaining Doctor Who: The New Adventures – All-Consuming Fire that would go through my head each time, stranded in the North Riding with far less mental faculty than me, let alone Sherlock Holmes, and feeling the same overwhelming fish-out-of-water helplessness, with a certain degree of satisfaction that the doctor was similarly stumped. The spontaneous combustion plot was rather less comforting to think of, with the fever I was running (but you can’t have everything, and oh look, I was prefiguring another Victorian spontaneous combustion Doctor Who story just last weekend). Another sudden collapse of self-image: usually I eat to cope. A lot. The doctors may have deduced this. Richard brought grapes, chocolate, goodies of various kinds (and two very lovely cards), and I just had to ask him to take most of them away again. Not because I was ordered not to eat them (except for the points when I was), but because I realised that I had absolutely no appetite whatsoever and it was too distressing to be reminded of it. I have a massive amount of stomach problems, but this was the only week I can remember when my appetite just went utterly flat. I was aware that with every hospital meal I had to force myself with every forkful, and still left bits (I do not leave food), simply because I was aware I had to eat and willed myself sternly to do it. Not even a giant incandescent chicken could tempt me. The week’s single happiest moment when Richard wasn’t there was being woken at 6am on the Thursday and realising that I’d been in a vivid dream of food, which meant that there was a chance I was becoming me again. One thing that I held onto – other than Richard – was my befuddled brain playing Doctor Who. One story above (literally, it occurs to me) all: another from the same range as All-Consuming Fire, this time Russell T Davies’ brilliant first official Doctor Who, 1996’s novel Doctor Who: The New Adventures – Damaged Goods. There will be spoilers if you’ve not read it. Because I was surrounded my curtains and full of drugs and exhausted, and until Richard brought in my phone I had no distractions or diversions, all I could do was fall asleep, or lie awake looking up. Looking up at the large panels of the ceiling, like a big noughts and crosses board. And vividly remember how noughts and crosses keep featuring through the book with what eventually turns out to be exactly the same hallucinatory importance I was experiencing. Although it was published the same year my most bedevilling health problem started, at least as a long-term health issue it’s a better one to have than young Steven Jericho’s: in a story of terrible bargains, happy blow jobs, families, death and war, the most haunting aspect is the endless visions of noughts and crosses that Gabriel Tyler receives without rest from his separated, unknown, hospitalised twin who can do nothing every day but stare up at his own noughts and crosses board. Uncannily, not only is the bulk of the book set during the same week of the year that I was in hospital, but it was during that very week this year that Big Finish announced they’re adapting it as an audio play. But like Gabriel’s, my visions of noughts and crosses came first, and knowledge of their significance afterwards. By the Monday, my brain and body were starting to function. Though I preferred being on average more conscious than unconscious, this wasn’t all good. The worst moment… Worse than when I was admitted – because that was a relief from pain. Worse than grumpy nurses trying to take my two gowns and telling me off for not bringing my own pyjamas – because I don’t have pyjamas, doubly not when on holiday, because I was too swollen to get anything over my legs, and I needed two backless, impossible-to-fasten-yourself gowns for courtesy’s sake, as I’m a naturist but am aware non-nudists didn’t want me flashing or mooning them as I tottered to the loo. Worse even than Tuesday when I hit ‘peak swelling’ at a huge, painful and absurd size – because I’d been inured to this being what I was ill with. The worst moment of all when I was in hospital came because I was able to clean myself. I’d been drenched in fever-sweat and unable to move for two days; when, in not a great twist, the cannula on the back of my hand ripped free while I was dozing, it at least meant there was a point when they had to disconnect my drip-feeds and I seized the moment to ask if I could have a shower. I was terribly weak but just determined enough to stagger to a bathroom, pull off my gown, and… Though I’d been conceptually aware of it, this was when I got the real blow to my vanity: there is just one part of my body that I like, and I’d never realised just how much of my limited self-esteem balances on it until I suddenly saw what a wreck the hospital had made of it. It’s still not right, but that initial shock in the mirror nearly stopped me coping. It’s the bits you’re not prepared for that tip you off the deep end. Partly as a way of mentally striking back with a physical change under my own control, and partly just because I didn’t have the energy and co-ordination to use a razor for several days, I decided then to grow a beard until I’d recovered. I have, of course, still got it. Sorry, Richard. Monday was also the day I changed hospitals. The one in Northallerton had mostly very friendly nurses and a cheerier ward, but it did turn out to have one serious disadvantage: a great many specialists all coming to see me and none, apparently, talking to each other (several of them even to me in my enfeebled state worryingly but plainly not having a clue). So let’s say that I wasn’t very happy when one decided seemingly at random that they should operate and told me, as if that wasn’t enough, that I couldn’t be sewn up but would just have to have a nurse pack the wound daily for a fortnight until it healed of its own accord. And let’s also say that I wasn’t very confident when another sent me for an ultrasound scan (on top of the x-rays, direct physical examinations of every kind and everything else I’d had) and those scan results said that there was absolutely no need to have an operation, because the assumption on which they’d based that decision was entirely wrong. And I wasn’t very happy at all when I was told I’d still be having the operation, pointed out the contrary information from later in the day, and was told that the doctors knew what they were doing. It turns out it was rather lucky that they didn’t have a theatre available and sent me to a larger sister hospital. Almost everything about the second hospital in Middlesbrough was less good. Twenty-five miles further north, in a town neither of us knew, so that rather than Richard being able to drive there in ten minutes it would take an hour, making a full seven-hour day for him to visit me for my five hours of blessed company. The hospital itself bigger and grimmer and the ward much more – disrupted, I’ll call it, and not say anything of the distressed or distressing other patients. The bed… I’ll come back to the bed. The hour’s ambulance ride there, which was excessively painful just as I was levelling out (though the paramedics were lovely). None of that matters. Because the best thing about the second hospital is that there was one consultant who saw me each time. One consultant, rather than half a dozen who only saw me once or twice each and made on-the-spot contradictory decisions. One consultant, who took the time to explain what was going on at every stage. One consultant, and this is less important but reassuring, who looked rather like Roy Marsden’s before he was eaten by vampires. One consultant, who most importantly of all had a f*****g clue and who on taking the notes from the hospital that had referred me for what I’d already weakly suggested and which his actually reading and cross-referencing them confirmed was a wholly unnecessary and dangerous operation, came remarkably close to expressing his professional opinion of some of the previous hospital’s personnel’s judgement and told me that I would definitely not be going into theatre that night, and detailed precisely why not. So the second hospital was able to tell me that I had two infections, named, interrelated and both very bad and with pretty horrible direct effects and heavily flu-like side-effects, but that I didn’t in fact also have the other one that a random consultant had just guessed at. Reassuring to know precisely and definitely what was wrong. Slightly less reassuring that, after they also ran all the possible tests all over again to see what caused it, I predictably came up zero on the forty-six or so most common possibilities, which at least means they were able to confirm I’m not at all infectious to anyone else but also means I don’t know what esoteric cause to avoid and so that it might just strike again at random. By contrast, perhaps the least appealing thing about the second hospital was the bed. Every bed in the ward had a whiteboard with the patient’s name above it. Every bed was a modern grey plastic creation with a wide frame and remote control elevation the patient could operate to get out of bed more easily or raise their pillows. You can see where this is going, can’t you? I was put in Bed 13, which unlike all the others in the ward never had my name put above it, and again uniquely was a narrow old iron frame which I had to clamber out of before they lowered it to change the bedclothes because the crank was too violent. Not that that occurred to the student nurse who, bored with listening in on rounds, idly kicked at it until the constant jolts of pain across my face prompted the senior nurse to stop her. My slightly thoughtless way of coping was to tell Richard this was because in 1958 the last person whose name had been put on the board over Bed 13 had died before the night was out, and they’d never changed it again. He didn’t think this was very funny. The number, the nameless horror and the ancient frame did give me the sense that I was incarcerated in a half-finished Christmas script by Mark Gatiss, though. The bed’s plastic mattress and pillows were no doubt practical for cleaning, but when I tend to get quite sweaty just as a matter of course and was mostly feverish while incarcerated, it meant the plastic would heat up against my skin like a furnace and I’d simply pour. One night I woke and was so sopping wet with sweat I had to plead with a nurse to change the sheets at 3am, which was one of my more mortifying moments and made rather worse when it transpired there were no spare pillowcases. I said I couldn’t sleep with a sodden rag under my head, so… They took it and left just the bare plastic pillow. That didn’t help. Should you ever find yourself in a similarly untenable position, here is my tip: ask for a large towel. Pillowcases they may not have had, but an intrepid nursing assistant found me a proper bath towel rather than the tea-towels they give you to dry with in the bathroom and I wrapped it snugly round both plastic pillows. Being considerably thicker than the cases, it was much more comfortable too, and psychologically it was a small victory. Gosh, I’m going on a bit, aren’t I? It’s therapy. Much like discovering that Carry On Doctor is still a documentary. It was a small, private act of protest. Both hospitals were festooned with signs saying that mobile phones were not to be used. Stern admonitions were given on admission. And I couldn’t get a signal in the first one, anyway. But after Richard tried to ring me on the ward phone number he was given and was told off because he should have rung my mobile – seriously – I relaxed a bit about occasional surfing to relieve the stupefaction, though I’m afraid I didn’t look at any messages because I just didn’t feel I could cope. And part of this was finding a rogue copy of Carry On Doctor online and slowly buffering it through the night as cheer in my most miserable moments. For me, Carry On Doctor’s one of the best of the series, and definitely the best of the non-historicals – though the ending is in some ways more disturbing than chopping the villains’ heads off. It makes a brilliant use of a brilliant ensemble cast, and you can really see it as a big relaunch for the series at a new studio but doing what they’d been most famous for. You can see it this Sunday morning on Film4 (and no doubt every other week on some channel). What I didn’t realise until I watched it illicitly in hospital was how half a century later it’s still uncannily Cinéma Vérité. Though the thermometers are smaller these days, even the wards still look the same, only split into half-length and with Sky Sports screens dangling above you that I would regularly switch off and that orderlies would be commanded to switch on to try and get me to pay for them. I even had one of the original beds. The only thing that let down the documentary realism was Frankie Howerd being woken at 6am. No, not that part – I was woken every night at at least 2 and 6 (or 12 ½ p in new money) as part of having my blood pressure checked every four hours, which they’d always be surprised to see going sharply up or down but which I could reliably chart by how close they measured it to my last having had fabulous morphine derivatives and whether my pain score was a manageable four or a pump-popping seven. What I found incredible was Mr Francis Bigger wanting to get back to sleep (“Sleep’s good for you!”) only to be interrupted immediately by more crashing about from the guy doing the washes, and the vacuuming and the tea. It’s nothing like real life! They always gave you at least twenty minutes to start to nod off again before the next noisy interruption. Though our tea ladies were always very kindly, and I was always very apologetic when I couldn’t force myself through a full meal. Oh, and that sadly the only seriously hot nurse I saw was only in my ward for a couple of minutes while he was helping transfer a patient, and at a point where I was physically about as far from a Sid James reaction as I’ve ever felt. So no lovely pair there. On a related note, day staff seem to have no idea what night staff do, as the question “Did you have a good sleep?” is one you can’t answer politely when you’re not only deliberately woken through the night on hospital policy but also constantly woken by patients being trollied in, patients being ferried out or patients being distressing in any number of ways (especially one night, where the suffering of one man was too near the knuckle and I had to go and sit in a loo down the corridor for half an hour because otherwise I couldn’t have dealt with my own). At no point did I ever have anything approaching a good sleep, though in the first night and day there was a long stretch of intermittently blessed unconsciousness and really excellently hazy painkillers. In hospitals there is also a different meaning of “comfortable”: you are never remotely comfortable, but what they want to know if your pain level is copeable or if they have to hit you on the head with a mallet to stop you screaming the place down (see ‘distressing patients’). If you have many prescriptions, you must remember to bring all the right drugs in in the right combinations on admission even if you’re passing out with pain. The nearest I had to a proper row was with the pharmacist in the first hospital. I’d just grabbed one of everything to illustrate what I take, not expecting to be kept in for a week. This meant that the drug that I use in an unusually small dose because I’m prescribed it for something completely different to most people confused her. And then, as I take 2.5-3mg (depending on how badly I’m doing) in a combination of 1mg from one bottle and 0.5mg from another, she only let me take 0.5mg as I’d not actually picked up both bottles. As I need a small but not that small esoteric dose for an esoteric condition, that was no bloody use at all. I preferred the pharmacist in the second hospital, who I first saw scurrying about bent over in an amazingly disreputable manner before he eventually introduced himself. I remain suspicious, not least because he was the only staff member there in the sort of white with green flashes uniform seen in the likes of Doctor Who – The Ark In Space or The Invisible Enemy, and looked uncannily like a cross between Ewen Solon and Charles Kay, who acted in just that sort of TV in just that sort of period. So perhaps he didn’t actually work there, and was just a ’70s method actor pretending to be on set. Or, as he claimed to be a pharmacist, on drugs. I have always known that Richard is the most marvellous person and the most perfect partner in the entire world, but now I have objective factual evidence. He gave up his holiday to spend every minute (and more) of the five hours allowed each day to come and comfort me – even when I really wasn’t in a good state for company, hospitalised 250 miles from home, and an hour’s drive each way for him. I am still pathetically grateful, to say nothing of what a lifeline he was at the time. He was always the first to arrive and the last to leave, and every day the only visitor who stayed right through. He is, objectively, better than everyone else and the most attentive visitor by a mile. Subjectively, he talked when I wanted him to, he was silently supportive when I needed him to be, and he was adorably affectionate. And from what I could hear of everyone else, he had far, far better conversation. Though I probably can’t go into detail on the parents I wanted to scream at to shut up, or the elderly sister who got bored of an old man just out of surgery not being a performing seal and told her husband to prod him to wake him up. Luckily for her, I was too feeble to prod her by hurling the bedside cabinet I had to hand. And on one night I was greeted by an older gay man who’d had no visitors and was in a lot of pain talking on the phone to a friend about how the only thing that helped him cope was the gay couple in the opposite berth who were being lovely in holding each other and talking all evening and generally being the most couply couple possible. Perhaps the thing I should be most grateful to my beloved for is the bit I didn’t see. I absolutely couldn’t cope with anyone else when I was in hospital, however much I love them – though it has been nice to see some of my family since, along with two lovely men who’ve visited me in my lonely flat – and he stopped me having to do so. He stopped well-meaning but just too much people contacting me in hospital, only brought in the messages he knew I’d want, and spent most of the remaining hours of his precious ‘rest’ time when back at the cottage on the phone or on Facebook updating people, reassuring people and answering endless questions from people, all so that I never had to. I love him so much. And yet I’m the bearded one in the abyss. Absolute proof that Richard is the best. Please be lovely to him. I take back what I said about pharmacists and the worst part in hospital, though. On the Friday morning, the helpful and competent specialist told me they were going to discharge me. He told me that they’d have kept me in had I lived locally, but that he knew we were on holiday (ho ho) and that we were only booked in where we were staying until Saturday morning. On balance, he thought it would be better for me to get home on Saturday rather than Richard have to find somewhere else to stay, get time off work and them not really be able to do much more for me in hospital except pump me full of drugs and rest. So I was warned not even to think of doing anything for a fortnight (and my usual recovery time is twice medical estimates, because I have so many things wrong with me ordinarily, which has of course been proven again since) and that I was being discharged not for being better but for being on balance manageable. At the time, I was much less feverish than when I was admitted, but actually much more swollen (that having got much worse before starting to improve) and still just as weak. Where the hitch came was with the ‘pumping me full of drugs’ part. I was told I’d need three different sorts of painkillers and antibiotics to take away with me, and that the hospital pharmacy would send them up. This was about 9am. I was told to expect them between 12pm and 2pm, and a kind nurse said Richard could come in early. This was fortunate, as he ended up staying longer than any of the other days as the time dragged on, and on. They stripped my bed and remade it, as I’d be out straight away… Which became a problem as it got later into the afternoon, when I got weaker and shakier but had nowhere to sleep, caught in a no man’s land where I was neither discharged nor not discharged. Or, as Richard described me, as I changed from patient to impatient. It was the promise being broken: I’d coped with being there all week, the first time I’d been hospitalised for about thirty years as opposed to all the many times going in for tests and consultants, and it was immensely draining but I could shut off enough bits of my mind to get through. But so close to escape, and just finding that always out of reach, that drove me up the wall. When 4.45pm and the pills eventually came and I tottered weakly out of the hospital to see it for the first time – and disappointingly find that what looked like a scrap-metal sculpture of Gonzo from the window was just an interestingly-but-less-interestingly-shaped tree from more accurate angles – I was more than slightly frustrated. Tip for unblocking hospital beds: don’t let hospital pharmacies delay patients from being discharged by eight hours for no reason at all. Still, you wouldn’t believe the sense of escape when Richard drove me away from there, despite all the pain. Just seeing anywhere else. Now there was an adrenalin rush. I had hoped we might get one tiny smidgeon of holiday on the Saturday morning by visiting York – lovely town, our favourite chippie, the Fudge Kitchen – but I was very evidently in no fit state, and still in way too much pain, quite apart from still having a severely suppressed appetite. On the bright side, by leaving early, we seemed to miss most of the traffic and to our great relief had a far less hellish journey going back to London. That, of course, was only the end of week two of my double-infection. It’s now nearly the end of week seven. I’m looking a little more me, and feeling a lot more me. I’m back to eating far too much food – but still not really up to much of the walking I’d been doing to try and keep my weight in check. It’s been pretty rough in between, though. Week three I went out just once that wasn’t to the doctor, and of course overdid it with catastrophic results. Much the same happened in week four, but the swelling was a lot less as I moved onto my fourth course of antibiotics (same as the third course I got from the hospital pharmacy, far more effective than the utterly rubbish first week’s variety, and I never knew what the serious second stuff they pumped in intravenously was), so I was quite confident I could be getting out more. Obviously, in week five I moved from merely still weak and feverish to the full-on flu-type attack and was far more ill than I’d been at any time since about the third day in hospital. So that was… Bloody terrible, actually. Week six I was still very knocked out but got a few things done, and at last the multiple massive cannula bruises all along my left hand and arm have vanished. Now late on in week seven, the former massive cannula bruise on my left hand has even stopped hurting. The swelling hasn’t, though. Both types of swelling are much better, but they’re still ‘tender’ (or just plain sore, depending), and while about a twentieth the absurd / horrific volume at peak, still noticeably inflamed. I finished the fourth course of antibiotics last week; I saw the doctor again this week; I’m on the fifth course of antibiotics. He’ll see how I’m doing in a fortnight. On the bright side, I’ve managed to get some things done this week though still very far from catching up any of The Lost Month And A Half, and most of the ill hours I’ve had to write off as ‘Lost Time’ this week have been my standard, familiar illnesses and not the one that slaughtered me a month and a half ago, so that’s encouraging, isn’t it? Whatever the doctor says, maybe this’ll work: the beard’s coming off tomorrow. OK, so that’s the important bit, but if you want answers to a few more questions, take a look at the headlines below and read the bits that you want to know about. Or you could just get on and watch an episode. The Doctor – Who Is He? Why Does He Travel? He’s an alien, from a world whose rigidly authoritarian rulers watched over all of time and space – but without interfering. He found that just watching and keeping everything the same bored him, when he wanted to get out to meet people and experience things for himself. So he took a TARDIS and the name “the Doctor” and left. A TARDIS is a machine (or a place, or an event) for travelling through time and space, the name standing for Time And Relative Dimension In Space. 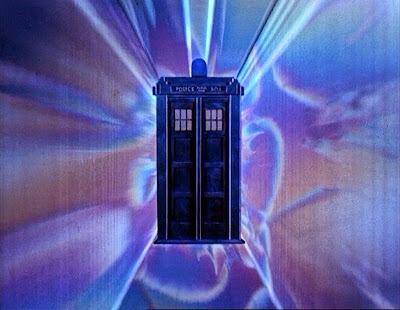 The Doctor’s TARDIS was a bit old and unreliable back when he borrowed it from his people, and he’s patched it up and customised it many times in the perhaps a couple of thousand years that they’ve been travelling together. Just to make it even less likely it’ll go where he wants it to (but more likely to go where he needs it to), it’s quite literally got a mind of its own, too. It moves seemingly by vanishing from one place, then just appearing in the next, travelling not through ordinary space but a strange space-time vortex. Once he started travelling, the Doctor found that that the more experience he had of other people and places, the more he wanted to get involved, because the more he saw the urge to dominate others the more he wanted to stand up to it. He’s opposed bullies, tyrants and monsters from many alien races – and from his own, and from ours – but one enemy always comes back. 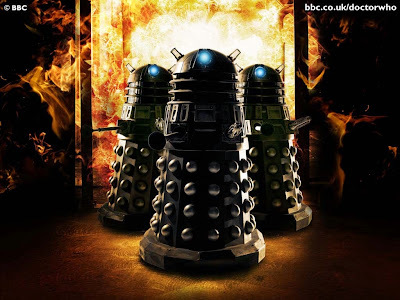 Those he’s fought most often in their endless campaign to dominate and exterminate without question are the Daleks, alien conquerors in armoured mini-tanks with a hatred for all other races. They’re the ultimate dictators, the opposite of the Doctor’s own desire for freedom. The Doctor’s people were each remarkably long-lived, so that helps more than moisturiser. But it’s not just that their bodies live for many hundreds of years. When they get too old, or are fatally injured, they’ve got a way of cheating death. At what would be the final moment, their body is reborn into a completely new one, giving them a new lease of life, shaking up their personality while remaining essentially the same person underneath. The Doctor’s had quite an eventful life, and the most recent body he’s been ‘born’ into is his… Well, it’s easiest to say it’s his twelfth. Some people might tell you that the Doctor is now in his thirteenth, fifteenth or twenty-third body, and they’ll all be right, but just as with the Time War, no-one has a precise answer and it makes no difference to the story. Similarly, while the Doctor is as a rule honest, he’s at best a little confused over his precise age. Perhaps on occasion he’s dropped a few hundred years or so for vanity’s sake (my money’s on the one in the leather jacket having a mid-lives crisis). But like his precise number of bodies, the Doctor’s exact age isn’t something we need to know – just as well, really, as we’re never going to. Just nod sagely and say, ‘Ah, well, things got complicated in the Time War,’ because if time was getting messed up to that extent by rival peoples each with the power to control it, things were bound to, weren’t they? These disconcerting rebirths also help Doctor Who the series carry on when the actor playing the Doctor decides to leave, making it almost the only TV show that can recast its lead without hoping the audience are watching TV with the picture turned off or pretending it’s something to do with plastic surgery or showers. The latest actor to play the Doctor is Peter Capaldi. It’s one bold central idea that’s important and that runs through now more than half a century of adventures. With Doctor Who, you can go pretty much anywhere and do pretty much anything, and always see that people everywhere are worthwhile, whether they’re people like us or green scaly rubber people. The Doctor believes in freedom, and hates ignorance, conformity and insularity. He doesn’t work for anyone, wear a uniform or carry a gun, making the series both very British and very anti-establishment. The best of Doctor Who would include a dash of horror, adventures in history, enough wit to make you smile, enough ideas and strangeness and to make you think, and enough action to get you excited. That’s probably too much to fit into just one piece of television, which takes you right back to the idea that you can go anywhere and do anything, because it’s not about just one piece of television, but different travels. Like the TARDIS, Doctor Who is bigger on the inside. It’s the only show where, if you don’t like where it’s ended up one week, if you want it to be scarier, or funnier, or more thoughtful, or more action-packed, the next week will be in a completely different place and time and probably in a completely different style, but still recognisably the same programme. You can read more on this blog (and my occasionally updated others) and any of my terrifyingly in-depth Doctor Who articles that take your fancy, or there are at least hundreds of thousands of other web pages, books and learned articles (though, obviously, I don’t think they’ll be as good. As with everything else about Doctor Who, your tastes may vary). But I wouldn’t just read, if I were you. Doctor Who is probably the best TV programme ever made, so the best way to find about it is just to watch it. Take a Deep Breath and plunge in. The new series started on BBC1 and on many other TV channels around the world last Saturday. Tune in every Saturday evening for the next three months to see more of it unfolding, brand new, that you know as much about as I do, with Peter Capaldi as the Doctor and whatever friends and foes there are to come. If you missed the first episode and are in the UK, it’s free on air this Friday (and doubtless many more times) on BBC3 and at times of your own choosing on BBC iPlayer. Or you can choose older stories in a multitude of formats – aside from the books and comics and CDs, you can find pretty much every single episode of the TV series on DVD and other formats, broadcasts, downloads and online (some of the latter even free and legal). If you do want more than the new stories to warm your darkening Autumn nights but the incredible range of choice is bewildering, here are two suggestions that might help in your selection. Ready? 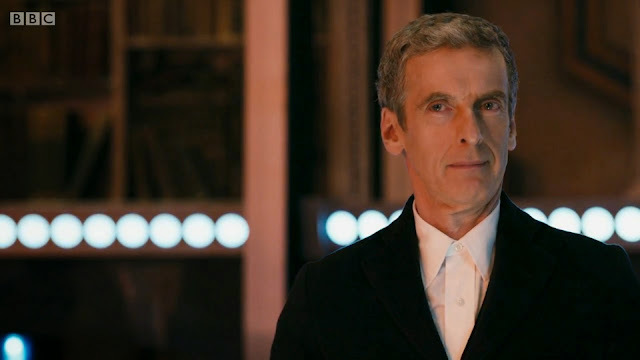 It’s now a few days after the full-length debut of Peter Capaldi’s Doctor. Back in 2010, a few days before the full-length debut of his predecessor Matt Smith, I published my pick of “The Eleven Faces of Doctor Who” – one story for each Doctor, to introduce them all. Or, rather, two sets of one for each Doctor, one my pick of more populist stories (or as mainstream as Doctor Who gets), the other of stranger or more thoughtful tales. They’re all easily available on DVD, with several in other formats as well. Click here to look at both lists and see if anything takes your fancy. Then watch one. They’re a good set of introductions for each of the other Doctors so far – except one. Four years later, there is of course a big addition to make. The Crimson Horror – and this Victorian horror story makes me laugh. The Day of the Doctor – the Fiftieth Anniversary special, starring three Doctors and featuring a great many more. Then choose your own Peter Capaldi story, because right now I’ve not seen those yet either! 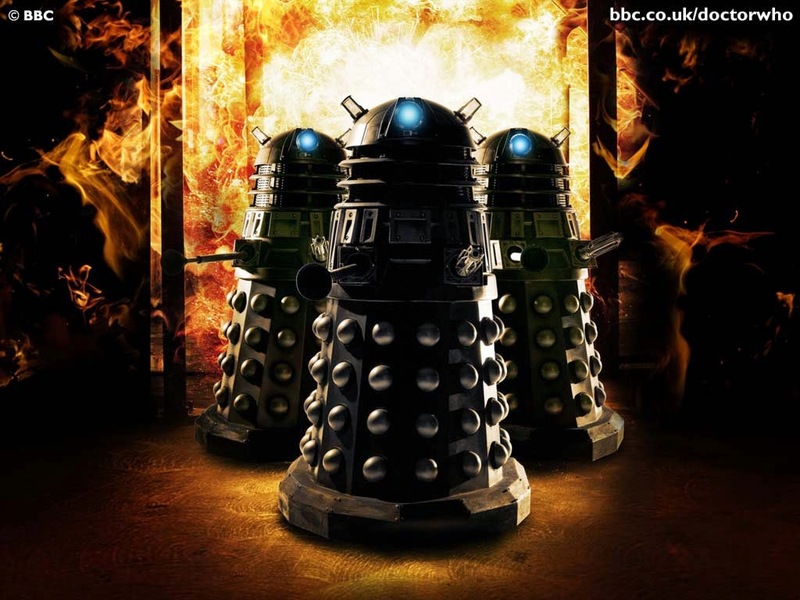 Or perhaps, rather than the hero in his many faces, you want to get into the Daleks. If so, here’s another article I’ve prepared earlier in which I explain who and what they are and give a rough idea of what I think of their stories so far. If you’re in the UK and your TV can receive the Horror Channel, you’re in luck. Several months ago, the Horror Channel bought the rights to show thirty different Doctor Who stories – at least two from each of the first seven Doctors. So my advice is, again, to turn on your telly (or other device) and watch one. Apparently their Doctor Who selection has been doing very well for the channel’s ratings, so with luck they’ll still be showing them in their two-episodes-daily run for some time to come. Besides, who knows? They’ve been quite a success, so they might decide to get hold of more stories to show. As far as I’m concerned, they’ve made an excellent set of choices so far. The thirty Horror Channel Doctor Who stories include fifteen that I’d give nine or ten out of ten to – and just five I’d score lower than five out of ten. I’m not going to give you a great long list of them all my own order of preference, though, because there’s something good about all of them and everyone’s tastes vary. They may or may not be great introductions to the series, but I love each of them especially, and if you happen to catch them on #WHOonHorror I can guarantee there’ll be something to entertain, amuse, scare, intrigue or offend. I just can’t guarantee which will apply to you. And if none of them happen to be scheduled for a repeat in the next few weeks, just try your luck and start with whichever one’s on! This is the third edition of an article I originally wrote in 2006 to introduce that year’s new series. Version one and version two are pretty much the same as each other; this time it’s more of a regeneration. Of my other Doctor Who writing, some of my favourite – and more bite-sized – pieces I’ve written to illustrate why Doctor Who is brilliant are a selection of great scenes and what makes them marvellous. These might be easier to take in than writing about a whole story at once. In theory there are going to be fifty of them eventually, but I’ve not quite got that far yet. 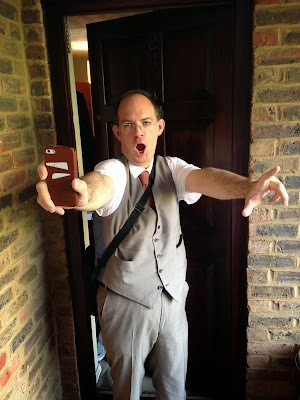 Still, click here for my slowly growing Doctor Who 50 Great Scenes and choose one at random. If you want a different perspective from mine, should you have a device that can read the Radio Times App, this week’s issue (search for 23-29 August 2014) has a particularly special free gift. As well as having Peter Capaldi on the cover and several articles introducing the new series, the electronic version includes the Radio Times Doctor Who Tenth Anniversary Special from 1973. I was given a tattered old second-hand copy when I was a small boy and loved it dearly, and I still think it’s one of the most gorgeous Doctor Who magazines that’s ever been published. It’s fun and it’s now free in electronic form with the ordinary issue, so I recommend it. “Much has changed about the Doctor over the years but much has remained the same. Despite the superficial differences in appearance, at heart, or rather at hearts (the Doctor has two) his character is remarkably consistent. “He is still impulsive, idealistic, ready to risk his life for a worthy cause. He still hates tyranny and oppression and anything that is anti-life. He never gives in and he never gives up, however overwhelming the odds against him. “The Doctor believes in good and fights evil. Though often caught up in violent situations, he is a man of peace. He is never cruel or cowardly. So why don’t you turn off my web page and go and watch a more interesting Doctor Who television programme instead? Labels: Daleks, Doctor Who, Peter Capaldi, Top Tips, Why Is Doctor Who Brilliant? Will Peter Capaldi know how to fly the TARDIS in an hour’s time? Take a Deep Breath! We’re thrilled looking forward to the new Doctor, and an old monster. Sixty-seven million years old (today). 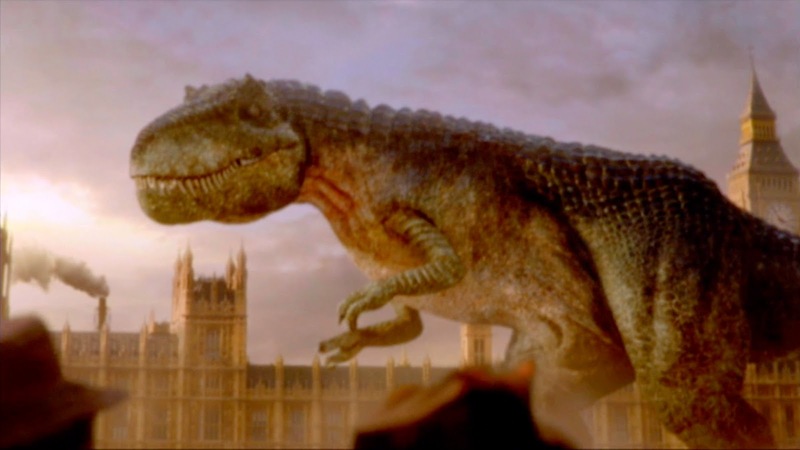 It’s not the first time dinosaurs have savaged London (and I’m not talking Boris vs Ken). Doctor Who history includes the 1974 story Invasion of the Dinosaurs, featuring Jon Pertwee and, as I’ve written before… Some problems. But it also boasts one of the most fabulous book covers (and onomatopoeic effects) ever devised. 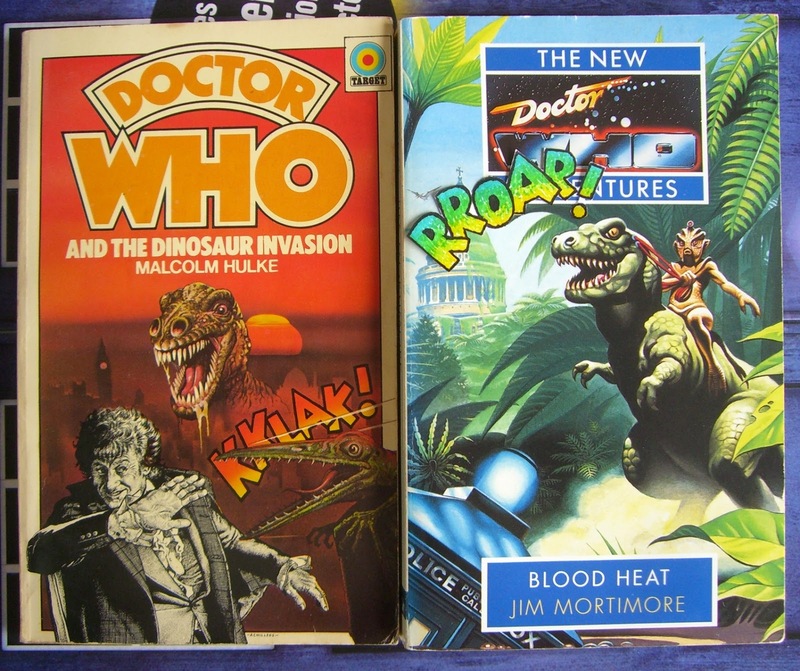 Doctor Who: The New Adventures – Blood Heat is a more thrilling if more obscure 1993 story published as part of the brilliant continuing book range that kept the series and Sylvester McCoy’s Doctor alive in the 1990s. It even features Silurians, too! But the cover of Jim Mortimore’s novel, while thrilling, isn’t quite as awesome as that of Malcolm Hulke’s novelisation from 1976. So I’ve drawn a very subtle bonus feature to fix that. I think you’ll agree it was just what it needed. I don’t know what tonight’s story will bring us, aside of course from another Tyrannosaur in the capital and a Doctor who’s at last not hiding his age, but I hope it’ll be every bit as exciting as its two predecessors. Now all they need is to commission a book version and a proper painted cover – both Chris Achilleos and Jeff Cummins are still around. There’s only one way to decide which… FIGHT! See it in an hour.